To me a house is more than just a place to reside, it is, in a lot of ways, one of the most influential places of your life. Your home may not be exciting, but it is the place where you will bring your first child home, where you will share joyous memories or mourn a loss, where you will find solace, comfort, and peace. 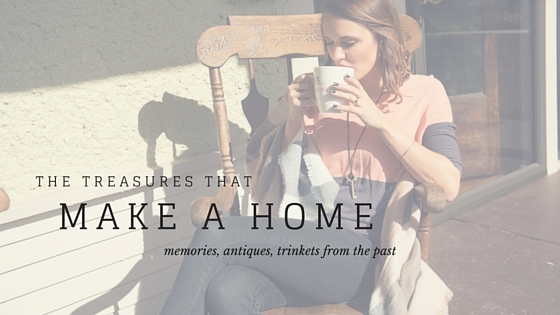 This is why I fill my home with meaningful treasures of loved ones from the past and trinkets to represent the eras before my time that have lead up to my existence. In my office I have a memory shelf with objects that bring both happiness and great sorrow. I have my bouquet from my lovely wedding earlier this year, a statue of Mary that I inherited after my great grandmother passed away, a school photo of one of my biggest role models (my grandmother), and a rose that I took from my late brother’s casket right before we laid him to rest. My downstairs bathroom is one of my most favorite places in my home. Not only is it 100% lit during the day by the sun, it has the original tub from when the home was built in 1910. I decided to get my maternity photos taken at home and just could not resist one in this tub in which I hung in the bathroom as a memory of the excitement for Jack to enter the world. I am also huge into bringing things in back to the home from it’s original era. I found this light plate from the 40’s that I had put up in the bathroom. While it is not entirely from the time that my home was built, it still adds charm from decades past. In the dining room I have our wedding champagne flutes on display along with our family engagement shoot photo. These represent our union as a husband and wife and a family. The day the three of us officially became one, all sharing the same last name! This rosary and pocket watch are so very important to me as they bring about a sense of comfort every time I see them. The rosary was blessed by Pope John Paul ll and the pocket watch was my late grandfather’s who I feel is the reason that I am the only Catholic in my family. He was so strong in his Christianity and always gave us trinkets that represented God and Jesus. A grandfather clock from Germany’s Black Forest was inherited from my husbands grandfather. I love to admire it and think of the previous owners during WWII and how it came to be in America, let alone, my house. I look at this shelf in my dining room every day. The box that holds some of the last items of my brother’s and the frame containing some of the last photos we had together warm my heart all the while breaking it at the same time. Having my brother’s memory present in special places throughout my home makes me still feel so close to him and helps me to reflect daily on the moments we shared while he was still among us. One of the most recent treasures that have found a place in my home is the chair on my front porch. I have a very special rocking chair from my great grandfather’s home in the nursery, but the chair on my porch comes from no one I really know. When we moved to the neighborhood an older couple lived across the street from us. The husband had lived there when he was a child and inherited the home when his parents passed away. His wife past away shortly after we moved in. They had a yard sale and sold the home. I just had to keep a piece of them in the neighborhood since their home was going to be gutted and all but torn to the studs to be rebuilt. They are just as much a part of my historic neighborhood as all of us new families that are starting to move in. I purchased this rocking chair that used to be the old man’s wife’s for $25 and put it on my porch. I love to sit in it and enjoy my coffee on nice mornings. It faces the home that it originated from and probably shared so many wonderful memories in.